1. Alex Lowes (Pata Yamaha Official WorldSBK Team) became the 74th race winner in WorldSBK history at Brno. He gave Great Britain its 230th win and its 630th podium placement. 2. It was a long wait for Lowes, winning on his 118th start. Among the other WorldSBK winners, only Chris Walker had to wait more for his maiden win: 131 races. 3. Yamaha recorded a 1-2 in a WorldSBK race at Brno for the first time since the 2011 Algarve weekend (In race 2 with Marco Melandri and Eugene Laverty). Another similarity to 2011 is that it’s the first time since then that two riders have taken their maiden win on Yamaha machinery. This year it was the turn of Pata Yamaha Official WorldSBK Teams Michael Van der Mark and Alex Lowes, in 2011 it was Marco Melandri (Donington) and Eugene Laverty (Monza). 4. WorldSBK has seen three Yamaha wins in the space of four races (a double at Donington and Race 2 in Brno): the last time Yamaha had been able to secure such a high number of wins over such few races was in 2009, when Ben Spies won four out of five in these two same tracks and in the same order (a double in Donington and Race 2 in Brno), adding a win in Race 1 at the Nurburgring. 5. The current field has now 10 WorldSBK race winners - the highest number since 2014 - when there were 11. 6. Laguna Seca had so far no less than 15 different winners in 30 races. Five of them are part of the current field: Sykes, Davies, Laverty, Melandri and Rea. The last seven races here were won only by British riders, which is the longest streak by a country in the track’s history. The last non-British winner at Laguna Seca was Marco Melandri in 2014, Race 1. 7. 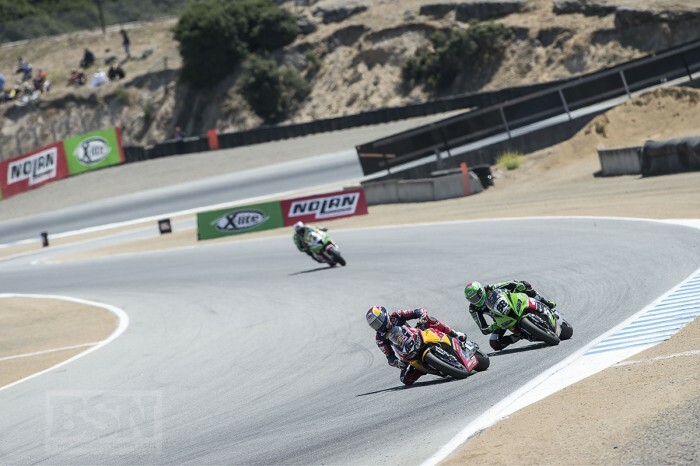 Six riders share the honour of the highest number of wins (3) at Laguna Seca: John Kocinski, Anthony Gobert, Troy Corser, Ben Bostrom, Tom Sykes and Chaz Davies. 8. Laguna Seca up to now had 11 different polesitters in 15 race weekends: only Troy Corser (3 poles: 1995, 1998, 1999) and Tom Sykes (2014, 2016, 2017) have recorded more than one pole here. 9. Troy Corser is the rider with most podiums at this track, 11, followed by Tom Sykes at 9. 10. Ducati has the record of poles at Laguna Seca. Their tally is nine, and one other manufacturer has recorded more than one - it’s Kawasaki with three. The other three manufacturers on pole here are Honda, Suzuki and Aprilia. Ducati was the sole polesitter in the first seven race weekends held at Laguna Seca (1995-2001). Colin Edwards broke the string in 2002 recording pole for Honda.